A cosy, yet spacious two bedroom cottage. Had a lovely week staying at Daisy Bank. The cottage was very well appointed and the location was exactly what was needed. It was a welcome break from the building work at home. The weather was very windy but after days out and about we could light the wood burner and relax. Will stay again. We're so pleased you enjoyed your break in Daisy Bank. It was our pleasure to meet you. We're pleased you enjoyed Daisy Bank this time. Thanks for the review. We have stayed with Park Fatm Cottages before and ocnce again we were not disappointed. This is an ideal location to get put and do some local walks and leave the car behind. Stow-on-the-Wold is a very short walk away and offers everything you need. The cottage provides everything you could want, the wood burner is fabulous, as are the views. There is plenty of space for your party and overall it's a really chilled place to stay. Personally, I find the beds extra firm but this is my only niggle. It's nice to hear you enjoy the cottage and the local walks. Thanks for coming back to us and thanks for the review. Beautiful cottages . Everything you could need for a restful , comfortable stay. The cottage was very clean . Gorgeous views from bedrooms and lounge . Owners were very helpful . We're very pleased you and your friends enjoyed your stay over New Year. Thank you for the review. Thank you for your kind words and we're pleased you enjoyed your break. We're slightly surprised however that you rated us 3 for Value for Money as we donated this holiday to Macmillan Cancer Support. Through the efforts of cottage owners such as ourselves who donate free holidays, Premier Cottages have raised over £120,000 for MacMillan Cancer Support. Thank you for purchasing the holiday at a MacMillan Charity Auction. A very nice property in an excellent location. Could not have asked for better. The property was in a great location close to the main town for pubs and restaurants and the location was really peaceful and picturesque. We're pleased you enjoyed the nearby pubs and restaurants in Stow. Thanks for the review. This home was perfect for our needs. It was a home from home. Everything we needed was provided and the all on one level was particularly good for our requirements. Thank you. Thank you for taking time to review. We're pleased that Daisy Bank, being all on one level, was well suited to your family group. A group of 8 (4 couples stayed for 3 nights in the Cotswold area. This was a perfect place for us to base our hikes and touring. Great hike right from the property to Stow, the Slaughters, Bourton-on-Water, and back. Easy 5 minute walk to Stow-on-Wold for dinner and shopping. The cottages are AMAZING. Great restorations of old buildings with all the comforts of home! This was the best and most relaxing portion of our 2 week trip to Scotland and England. Tiana provided exceptional information during our trip planning phase and gave us fantastic recommendations. We're so pleased that you all enjoyed your visit to Park Farm especially walking around the lovely Cotswold villages. Thanks for the super review. It was a pleasure to host you - thanks for the great review. is a beautiful village shall be coming back again. Thank you for the great review. We look forward to seeing you and your family at Park Farm again. All that it seems so be. 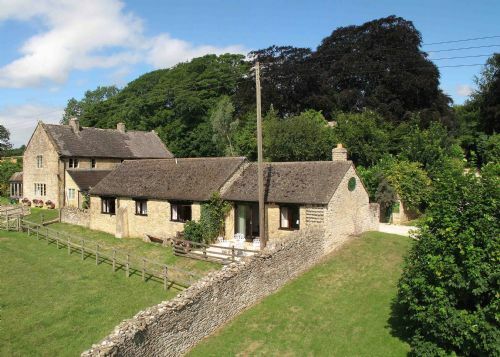 Park Farm is set within a very rural location, yet is only a few moments walk from the centre of Stow on the Wold. Everything you require to support a self catering holiday can be found in the spacious cottage that is Dairy Bank. The lounge is comfortably furnished in a way that allows for peaceful relaxation. The kitchen, together with its appliances, is of a high standard. The fourposter bed adds a classic air to the cottage. The Internet connection is first class should it be needed. Maugersbury is what could only be described as a very desirable and idyllic Cotswold village, Cotswold stone abounds throughout a village that sees its houses and cottages located in their own very individual and characterful settings. Our hosts ensure that their guests have a very comfortable and enjoyable stay. Over all, an excellent cottage in a wonderful location. A great review that gives lots of detail, thank you so much. We have just returned from a wonderful trip to Daisy Bank cottage. The cottage, surroundings and hospitality from Tiana and John were amazing. They are a lovely couple who have provided first class accommodation in the most beautiful setting. We hope to return someday soon. Many thanks for the lovely review. It was a great pleasure to host you and your super family. A superb spot in the Cotswolds. Daisy Bank never fails to satisfy. It's a lovely cottage with a wonderful view over the Cotswolds. It's well equipped, very clean, and well maintained. Thank you for the review. It's always a pleasure to see you both at Park Farm. A very comfortable cottage to stay in. This cottage is in a beautiful part of the country. It has everything you need and Tiana and John were very friendly and made our stay even more special. Being able to walk into Stow on the Wold is an added bonus. Thank you, we're pleased you enjoyed the cottages. Delightful bank holiday mini break. Everything just as stated on the website. The hosts were very knowledgable about the local area and places of interest to visit. Also essentials like cooking oil, salt, pepper, milk, tea, coffee, sugar and sweeteners. Not forgetting the kit kats to enjoy with your first cuppa. Thanks and,yes, KitKats are a Park Farm staple! At first look Daisy Bank looked a little underwhelming - from the front just a low rise building with a front door and one window. Once inside it was a revelation - very spacious with a glorious view. Very comfortable with the added bonus of being just a short walk. Into town. The owners were friendly and welcoming and once we had left telephoned us almost immediately to let us know we had left some clothes behind and that they would forward them on. Highly recommended. Thanks for the review - very pleased you enjoyed the view from Daisy Bank. Park farm is quiet, comfortable with ambience and in a most beautiful setting and yet is only a short walk into Stow. It offers glimpses of a bygone age when times were gentler. We love the atmosphere with comfortable accommodation and total quiet and dark nights ensuring a good nights sleep. We have no negative comments - only positive ones that give testimony to our regular visits. The owners are always friendly and attentive to your needs but in the background and only available when needed. All in all one of our favourite UK holidays which we usually share with family or friends. Thank you, it's always a pleasure to see you at Park Farm. We had a great stay at Daisy Cottage for couple of days .Everything was exciting and excellent.Landlords of the property stays nearby and they are wonderful people who will help with any advice or help.I would highly recommend this property. Thank you. It was a pleasure to meet you and your family. Only negative comment: we were cold the first night. Perhaps heating could be turned on earlier, on day of arrival, if weather very cold. Otherwise facilities, location and sevice best ever experienced. Yes, of course, we're here to make our guests happy! As regular visitors, we are always delighted by the comfort , cleanliness & appointments in Daisy Bank. Despite poor weather this year, the same was true of our latest visit. We'll be back! Thanks for taking time to review. We'll try harder with the weather next time! Thank you for your review - we're glad you enjoyed your stay at Park Farm! Beautiful stay in a fantastic location. The owners are on site and are very friendly and can not do enough for you. The cottage was spotless and very cosy. Lovely walks straight from Park farm. Will definitely be returning in the near future. Thanks for your great review. We look forward to welcoming you back to Park Farm in the future.